These bolt on 1.5″ wheel spacers are designed to give you a little more width without changing out your axle for a wider one. Great for use on solid axle conversions to make the front axle similar in width the wider rear axle found on 86 and up Toyota trucks. Bolt pattern is 6 stud on a 5.5″ round circle. Features safety graded studs and matching nuts for proper fit. Made from Billet 6061-T6 aluminum. Grade 8 Studs, Grade 10.9 nuts. Shipped as a set of 2 spacers w/nuts. Every spacer features a precision machined surface. Only high quality nuts and studs that are hardness graded and stamped are used. 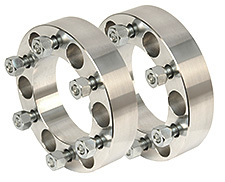 Six lug wheel spacers fit Toyota FJ Cruiser, Pickups, 4Runners, FJ-40, FJ-60 & FJ80.